Ken Ham, a "Young Earth Creationist," is President and CEO of an organization called Answers in Genesis (AiG), as well as the Creation Museum in Petersburg, Kentucky. Since 1979, Ham has been involved with foundations, ministries, and organizations with the mission of discrediting evolutionary science and replacing it with creation science. For many people, creation science is coterminous with "Intelligent Design." But not for Ken Ham and his organization. They go further and insist that the earth isn't 4 billion years old (which is the presumed age based on radiometric age dating of meteorite materials), it's only a few thousand years old (hence the name "Young Earth Creationism"). PBS produced a 5 minute video on Ham and the YEC position that can found here. Just to test my hypothesis on this point, I asked an acquaintance of mine how old he thought the earth was. He said, "Really old. But who cares?" Exactly. Nobody cares how old the earth is. In fact, in all my interactions with people who are skeptical of Christianity (or religion in general), the age of the earth has never been an issue. Come to think of it, the only place I've ever heard an argument about the age of the earth is at church. Ironically though, it has little (if any) bearing theologically. Whether the earth is young or old, the human vocation is the same: worship God with all your heart, soul, mind, and strength. If nobody cares and the conclusion has little bearing on Christian believing and living, then what's the big deal about this issue? What is there to gain by "proving" the earth isn't millions of years old? I submit to you that Ham's version of Young Earth Creationism is wrapped up in more than just determining the age of the earth. 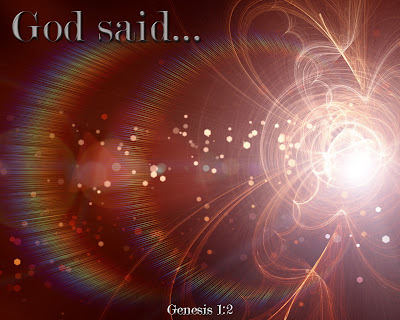 With all his talk about literal 24-hour days of creation, dinosaurs and humans coexisting, and miscontrued fossil records, Ham is attempting to prove the historical-scientific accuracy of the Bible in general, and Genesis 1-11 in particular. The thought goes, "If the Bible is right on this matter, then what else must the Bible be right about? Ah, yes, it's right about Jesus too! And you know what that means? It means all those evolution-believing atheistic humanists are wrong" (please sense the hyperbole here). This notion is reinforced by Georgia Purdom, a staff member of AiG. She insists, "If God's word is not true concerning the age of the earth, then maybe it's not true concerning other events of the Creation week; and maybe God was not a necessary part of the equation for life after all" (article: "The Intelligent Design Movement: Does the Identity of the Creator Really Matter?"). She got this line of thought from Ken Ham, who also insists, "[I]f Christian leaders have told the next generation that one can accept the world's teachings in geology, biology, astronomy, etc., and use these to (re)interpret God's Word, then the door has been opened for this to happen in every area, including morality" (article: "A Young Earth - It's Not the Issue"). "It is most unfortunate that those who debate this issue begin by assuming that the words 'creation' and 'evolution' are mutually exclusive. If everything has come into existence through evolution, they say, then biblical creation has been disproved, whereas if God created all things, then evolution must be false. It is, rather, this naive alternative which is false. It presupposes a very narrow definition of the two terms, both of which in fact have a wide range of meanings, and both of which are being freshly discussed today....Of course any theory of evolution which is presented as a blind and random process must be rejected by Christians as incompatible with the biblical revelation that God created everything by his will and word, that he made it 'good,' and that his creative programme culminated in Godlike human beings But there does not seem to me to be any biblical reason for denying that some kind of purposive evolutionary development may have been the mode which God employed in creating" (John Stott, Understanding the Bible, 55). In light of all this, we must refrain from a wholesale deunuciation of evolution. This pertains especially to parents, youth pastors, and pastors who seek to drive a wedge so deep between creation and evolution that the two can never possibly meet. In some churches you could easily mistake Charles Darwin's name for an expletive of the worst kind! But even Ken Ham admits that Charles Darwin was right about natural selection. I'm not a scientist, but I know a few people who are scientists. When I asked them about Ken Ham, they pointed out that his methods aren't considered scientific so his conclusions aren't either. In fact, Howard University anatomy professor, Daryl Domning, said of the Creation Museum, "This bothers me as a scientist and as a Christian, because it's just as much a distortion and misrepresentation of Christianity as it of science" (article: "Palientologists Insulted by Creation Museum"). This was interesting to me. I had always heard that Ham's conclusions were rejected because they pointed to a Creator. But those in the scientific community are telling me that his conclusions would be accepted if they were discovered through properly scientific methods. And while we're at it, what are Ken Ham's credentials anyway? He earned a Bachelor's degree in Applied Science (Biology), a Diploma of Education. He worked as a high school science teacher in Queensland, Australia. And he was awarded (read: given) honorary degrees by Temple Baptist College in 1997 and Liberty University in 2004. The first chapter of Genesis is a beautifully rendered poem that celebrates the ease with which God can create, act, and transform all things - in heaven and on earth. To take the lively prose as if it were bare physics is to mangle the gift offered by the words. This is important because Ham hangs his hat on the translation of the word "day." There's no arguing that the word carries connotations of the sun in the sky and eventually setting down over the horizon. But to insist that this account is either historical-factual or the entire Bible can't be trusted is completely wrong-headed. That's as foolish as saying that we can no longer trust the Bible because the stories of the Prodigal Son or the Good Samaritan are about events/people that didn't exist. None of us do that. Why? Because we know that those stories are called parables. So the issue with Genesis 1 is about the genre of the text. 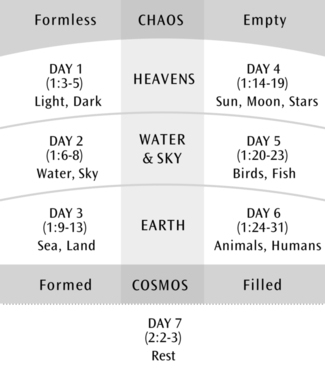 Is it a scientific account of cosmology, astronomy, zoology, botany, biology, and anthropology? Or is it something of a different sort? To this question, Walter Brueggemann, a respected Old Testament scholar, writes, "This text is something of a liturgical narrative, which tells the tale of creation in a highly stylized way" (Theology of the Old Testament, 153). He continues, "If it is correct, as critical consensu holds, that this is an exilic text [formed during the Israelite exile], then the effect of this liturgical narrative is to enact by its very utterance a well-ordered, fully reliable, generative world for Israelites who are exiles in Babylon. The world given in these liturgical utterances is a 'contrast-world,' compared to the world of exile that holds threat, anxiety, and insecurity" (Ibid., 153). What's going on in this creation text? There is God who creates the heavens and the earth. There is chaos (Heb. tohu) and emptiness (Heb. bohu), which has been translated "formless and void." The Spirit of God is hovering over it all. Then a word. Light and dark, the first day. Water and sky, the second day. Sea and land, the third day. Days 1-3 bring form to that which was "without form." Another word. Sun, moon, and stars, the fourth day. Birds and fish, the fifth day. Animals and humans, the sixth day. 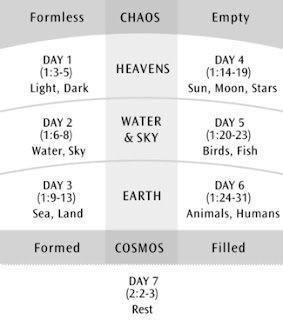 Creation on Days 4-6 fills the spaces created in Days 1-3. Day 4 fills the space created on Day 1. Day 5 fills the space created on Day 2. Day 6 fills the space created on Day 3. It's all good and God is so pleased. So how old is the earth? Nobody knows and I don't think it really matters. But whatever you believe about the age of the earth, you should at least admit that your view is based on speculative scientific arguments that are outside the scope and intention of the Bible. 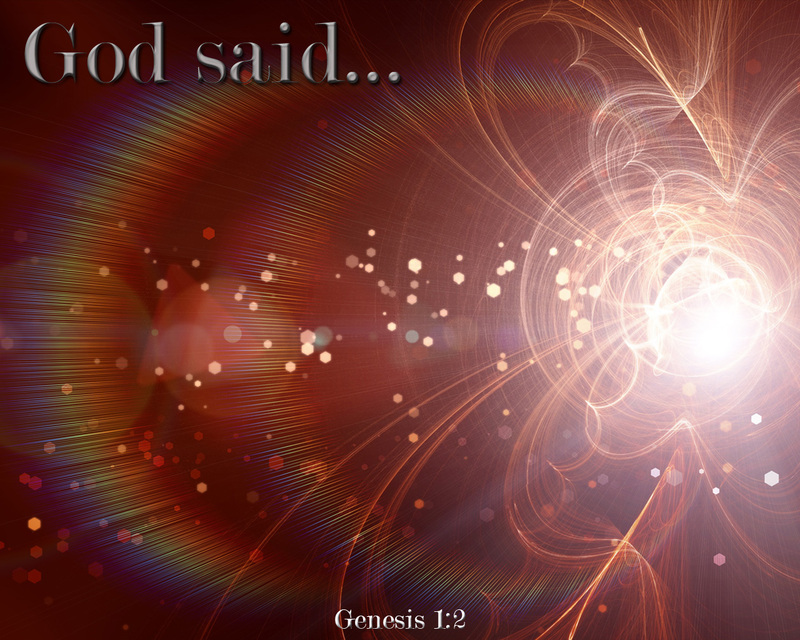 The opening chapters of Genesis use a mythological, literary, poetic style. That doesn't make them less true, because truth in that genre isn't the same as factuality. They are true in that they attest that God created, and in doing so, he has acted to bring order out of chaos. He did it then and he can do it now - that's the point. Note: Daniel Jepsen, pastor of Franklin Community Church, has posted a helpful review of Ken Ham's DVD called "The Six Days of Creation." You can find it here.